Nielsen estimates that Americans buy 58 million pounds of chocolate in the week preceding Valentine’s Day. Decontextualized from the industrial farms where children of colour and nonhuman animals are forced to work without compensation, these products are imbued with the aura of “love.” Purchasing them is one of the rituals of compulsory heterosexuality, which represents another way in which our desires are manipulated to reproduce the status quo. 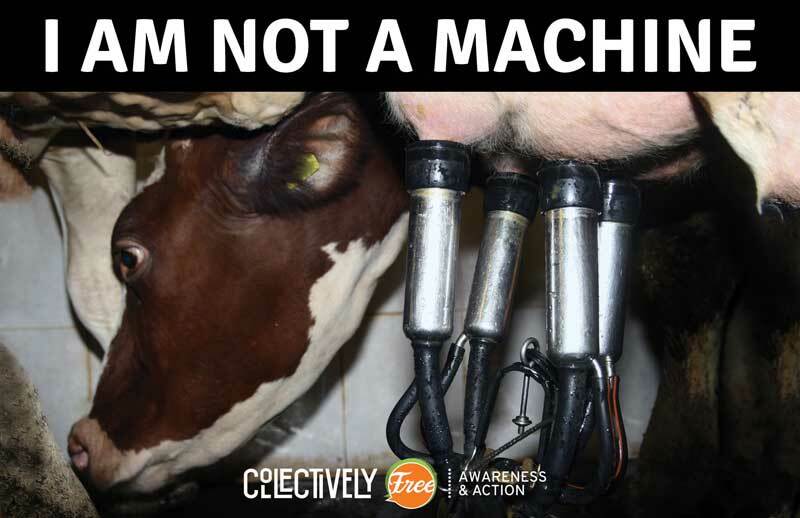 In routine “dairy” production, mother cows are impregnated without their consent and denied the joy and pleasure of bonding with their babies, who are taken away hours after birth to be used for veal. 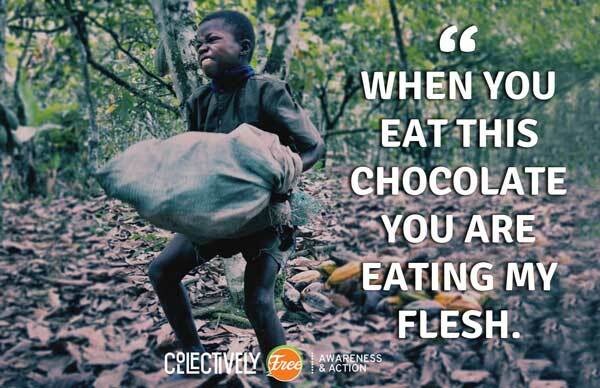 On Africa’s Ivory Coast, the supplier of 70% of the world’s cocoa, human traffickers steal children from their families to work on cocoa plantations, promising their parents that this will help to alleviate the severe poverty that families in this region often face. Children as young as five years old may be abducted, and villages in Mali and Burkina Faso, two of the world’s poorest countries, are frequently targeted. Physical abuse abounds: undercover investigators with Mercy for Animals discovered workers beating and even stabbing cows at a Nestlé milk supplier, and child slaves on Ivory Coast plantations face beatings for attempting to escape and struggling to carry sacks of cocoa pods that can weigh more than 100 pounds. These are not problems that the removal of a handful of aggressive individuals can solve, but practices that are normalized by a culture of violence. Ivory Coast cocoa plantations and industrial “dairy” farms are dangerous and filthy environments that leave scars from machetes and electric prods on vulnerable bodies. Mother “dairy” cows are slaughtered when they are too weak and exhausted to continue to work, and their bodies are made into hamburgers, soup, and dog and cat food. “When people eat chocolate, they are eating my flesh,” said Drissa, a child slave who managed to escape an Ivory Coast plantation. During his years working on the plantation, he never tasted a piece of chocolate. Baby calves in the “dairy” industry never taste a drop of their mothers’ milk. All too often, eating chocolate is eating the flesh of the most vulnerable individuals exploited by capitalism. Nestlé, Godiva, Hershey’s, Cadbury, and Mars, the world’s largest producers of chocolate, disproportionately use cocoa from Ivory Coast. You can find out more facts about child slavery in chocolate production here courtesy of the Food Empowerment Project, a wonderful vegan organization. In anticipation of Valentine’s Day, Collectively Free will hold disruptions and leafleting campaigns across North America in stores that sell chocolate products produced by the aforementioned corporations. We will tell the stories of children like Drissa and unnamed mother cows treated as disposable lives, disrupting a pattern of consumption founded upon racism, speciesism, colonialism, and heterosexism. Nestlé, an incredibly wealthy multinational corporation that has caused unimaginable misery for humans and nonhumans, initially formed under the name of the “Anglo-Swiss Condensed Milk Company” in 1866. In 2014, Nestlé made 16.7 billion francs from cow’s milk products. When most people think of Nestlé, chocolate brands that heavily feature cow’s milk as an ingredient, including KitKat and Smarties, come to mind. Cocoa is native to South America, and was introduced to Europe within the context of the slaughter and enslavement of the Mayans and Aztecs. In the mid-nineteenth century, the invention of the chocolate bar opened up a new market for the consumption of cocoa, leading to further colonization and exploitation. In the late nineteenth century, the earliest instances of cocoa farming in Africa provided opportunites for European colonizers to enslave Africans in spite of the abolition of slavery (at least in name only) in America and many European nations. The expansion of cocoa production in Ivory Coast in the early twentieth century was facilitated by French colonizers. More information on the intertwined history of chocolate production and slavery can be found in Anti-Slavery International’s report, “The Cocoa Industry in West Africa: A History of Exploitation.” Within this context, milk chocolate was invented with significant support from Henri Nestlé, and Nestlé began selling it in 1904. You can read more about Nestlé’s history on the corporation’s own website. In the 1970s, Nestlé’s heavy marketing of expensive cow’s milk-based infant formula to human mothers in the global South led to widespread malnutrition and death of infants, another example of brutal economic colonialism. Peter Brabeck-Letmathe, Nestlé’s former CEO, notoriously denied that access to water is a human right in the 2005 documentary, We Feed the World, and Nestlé continued to bottle water during the California drought. 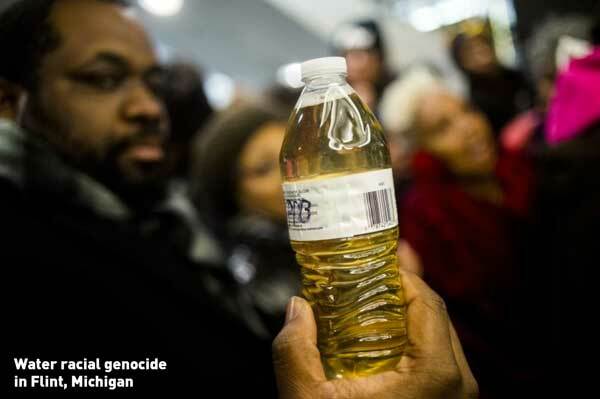 Nestlé still bottles clean water in Flint, Michigan for its Ice Mountain brand as poor families suffer, and has been sued repeatedly in northern Michigan. Following an investigation of its cocoa plantations in the Ivory Coast by the Fair Labor Association in 2012, Nestlé agreed to uphold the organization’s ten Principles of Fair Labor and Responsible Sourcing. However, further investigations by the group continue to uncover numerous violations, including the use of child slavery, proving that this is a systemic issue that Nestlé’s humane-washing and the hypothetical “redemption” of a system that values profit as the highest good cannot solve. Why are we protesting the chocolate industry specifically? Privileged vegans will be quick to point out that there are plenty of organizations working for human rights already and argue that ignoring this issue is justified because nonhuman oppression is all too often neglected by other movements for justice. However, the example of Nestlé demonstrates that there is no form of oppression that exists in isolation. Valentine’s Day and the chocolate industry are examples of the invisibility of the worst forms of human and nonhuman animal exploitation. Most people who eat the flesh of dead nonhuman animals feel uncomfortable about the violence required for this (if only unconsciously), but middle-class people in the global North, including many vegans, associate chocolate with happiness, pleasure, childhood nostalgia (of a normative, white kind), and love (again, in a particular, normative form) rather than slavery and death. Valentine’s Day and the chocolate industry are examples of the impossibility of divorcing these horrific abuses from the existence of powerful multinational corporations, of treating them as isolated incidents that can be addressed without challenging the social and economic order that structures our lives. Academics who study radical social movements have long been aware that a universal vision is vital to the flourishing of uprisings for change. Charles Derber and Karen Marie Ferrogiarro’s book, What’s Left? : Radical Politics in the Postcommunist Era, provides one of many overviews of this idea. Movements for justice must speak to the struggles of women, people of colour, queer and trans people, disabled people, and nonhuman animals, and address their specific concerns. At the same time, they must target a common source of suffering. This is something largely absent from the mainstream nonhuman animal rights movement. The uncomfortable truth is that there has been an abysmal lack of improvement in the material conditions of farmed nonhuman animals over the past quarter century, despite the efforts of nonhuman animal rights activists and increasing awareness of veganism. The nonhuman animal rights movement continues to be largely rejected by the Left, and negative attitudes towards the nonhuman animal rights movement predominate. This is what happens when the liberation of nonhuman animals is presented as a single-issue topic. This is what happens when animal liberationists praise corporations that profit from exploiting millions of humans and nonhumans for providing “vegan” options. Please read our page, “Why Activism, Why Direct Action?”, for more information on why single-issue politics and advocating for dietary change are not enough. The exclusion of nonhumans from other social justice movements also hinders the development of a universal vision, since the smooth functioning of the capitalist system has always heavily relied upon their subjugation. Emptying crates of veal calves (one wonders if, under capitalism, this might be done through forced sterilization or the killing of “surplus” nonhuman animals by large agricultural corporations?) will have little value for our collective dreams when the structures that enslave children like Drissa remain in place. Would you like to join us for actions? Download our literature here, print signs and contact us here or via Facebook if you haven’t yet found a chapter where you live. A list of vegan and slave-free chocolate options can be found here via the Food Empowerment Project.